It’s time for your little ones to have some fun during the vacations !!!! 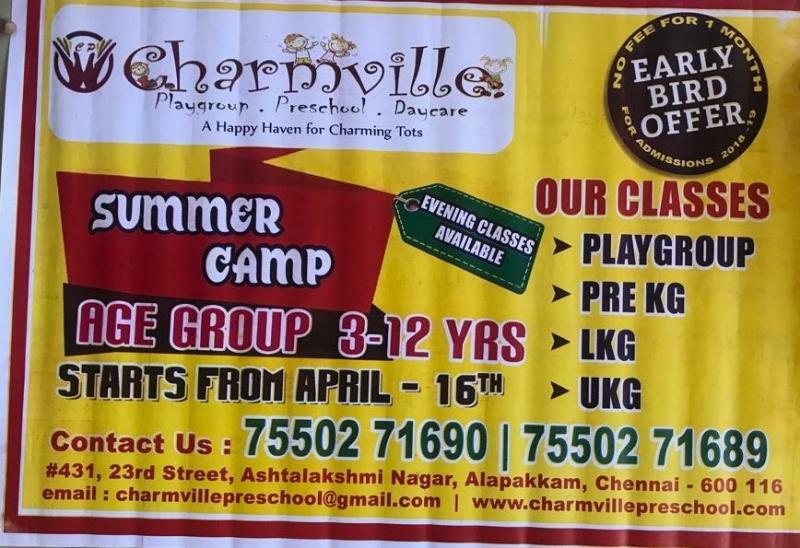 ”CHARMVILLE PRESCHOOL” has come up with a variety of exciting activities ranging from STORY TELLING, DANCE, MUSIC TO HAND WRITING, ART & CRAFT, FIRELESS COOKING…… catering to various age groups. Grab your opportunity and give your children between the age groups of 3 – 12 years a memorable summer vacation. Contact us for further details :- 7550271689/ 90. Address :- #431, 23rd street Ashtalakshmi Nagar, Alapakkam, Chennai – 116.